Mill discharge hose is an abrasion resistant durable lay-flat hose for pump discharge and hydrant water supply service. 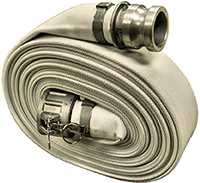 Mill hose is designed in the style of fire hose, but is more economical and in a wide range of sizes. Our single jacket mill hose has a rubber tube, and a thick outer textile jacket that acts as the hose cover and reinforcement. The cover will not mildew or decay, and rolls up flat for easy storage. This hose is also available with abrasion resistant steadfast coating in a variety of colors for easy identification (by custom order). Available with internally expanded fire style hose fittings or band clamped contractor style hose fittings (as shown).